Beds: 1 Double Bed. 1 Sofa Bed Simple. Equipment: Audio Equipment. Toaster. Television. DVD Player. Microwave. Coffee Maker. French style apartment, it has room for two people. The main bedroom has double bed. The bathroom is complete with bathtub. Services: TV Cable, Telephone, Security Box, Internet. If you want authentic atmosphere rather than an antiseptic hotel, then this is what we offer. EL departamento es hermoso y el bario también. Todo salió muy bien, Gracias! Lovely guys, lovely place! Thanks alot! Will come back! Hasta luego! Muchas gracias! Nice apartment. Clean and good location. Perfect for the family or to be alone. Very nice place in a lovely neighborhood. The apartment is very cozy, great for couple and to stay home - the photos here are really faithful to the real place. It's well located to enjoy the night and day life of San Telmo. There are buses and subways nearby, and it's very easy to find yourself an autobus to go to Caminito, Palermo, and other touristic places. The famous San Telmo fair happens on Defensa, right out urge door so be prepared for a musical and sunny Sunday. It's full of wonderful places to eat around, like Gran Parrilla del plata, Panaderia de Pablo, Guena Yunta (en Chile, with the best milanesa you will eat, and the nicest staff you will find), right besides the statue of Mafalda and her cute friends. The coffees are another great experience here in San Telmo, like the famous and delicious La Poesia, three blocks away from the apartment - we literally spent hours there. Also, we felt very safe in San Telmo, we walked by the streets in many different hours and there was always someone, some place opened and we'll lightened streets. It was a really nice stay, and I only have good things to say about Casa San Telmo, whose staff was caring and fast to answer, and this beautiful apartment. El apartamento fue óptimalmente situado en la calle Defensa del barrio San Telmo, que los domingos alberga el mercado de artesanía que se extiende por una docena de cuadras de Plaza Dorrego hasta la Plaza de Mayo. Muy cerca se encuentran las tiendas de comestibles, lavandería y numerosos bares y restaurantes. La famosa Plaza Dorrego se encuentra a sólo 4 cuadras de distancia. Disfrutamos del apartamento, especialmente los techos de 14 pies, balcones de hierro forjado dando a la calle Defensa, y la artesanía francesa-colonial. Recomiendo encarecidamente el apartamento para una sola o una pareja que disfrutan de las compras en las ferias de antigüedades y artesanía y que son lo suficientemente capaces de llevar una maleta pesada hasta tres tramos de escaleras. La dirección y el personal con el que tratamos era muy servicial, atento y puntual. He pocas veces había disfrutado tanto valor para una estancia larga (de 3 semanas) en una ciudad importante. No hicimos uso de la TV, encontrando mucho mejor hacer un "live-stream" de nuestro entretenimiento por medio del Wi-Fi proporcionado. Nos vinieron preparados, habiendo traídos el conversores, adaptadores, cables de extensión y los enchufes múltiples necesarios. It whas a good apartment, but every sonday to much noise from the marked of San Telmo. Technical all OK. The apartment is near to much aktivities in the night. We loved our stay in San Telmo, the apartment was perfect for us, roomy, full of light, airy and tastefully appointed. Maybe somewhat tired but so were we after our travels, so the charm and location totally outweighed this. It was a gem. The space looks exactly the same in person as it does in pictures and you can\'t ask for a better location. The bathroom is a bit claustrophobic but the rest of the apartment is bright and airy and gets a great breeze when all windows are open. Mercedes and her office were very helpful and we would definitely recommend staying here during your next visit to Buenos Aires. muy lindo, lleno de luz, perfecto para una pareja! 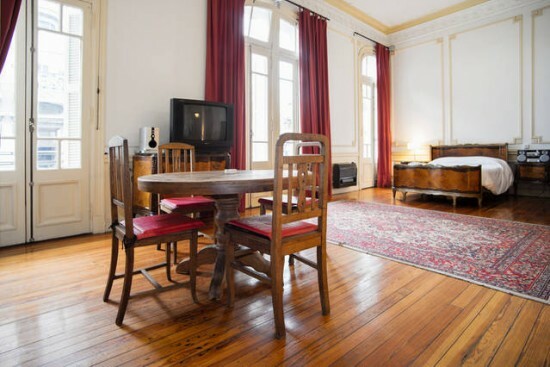 This is a lovely apartment in an old French-style building with high ceilings and multiple balconies. The space itself is great, and within a 10-minute walk of most subways. Just note that weekends can be noisy with bar-goers and the Sunday fair, and that the hot water for showers is limited. However, for short stays (we stayed for two months), this should not be too much of an inconvenience. A wonderful apartment with a great ambience to it, plenty of light and great period furniture. It looks exactly as the photos show it. I really enjoyed my time here. The location is fantastic, right in the heart of San Telmo. Although it didn't worry me, it can be very noisy with colectivos passing nearby, and Independencia is a busy street, plus the street fair is right outside the window on a Sunday. The apartment was nice, owner was helpful! My girlfriend and I spent the last week of our 3 week South American vacation at this apartment in San Telmo. The suite had beautiful architectural features, high ceilings and french doors leading to a balcony overlooking the cobblestone street. Location was excellent, right on Defensa street., which is closed Sundays for the San Telmo Antique Market. However, be prepared for street noise - earplugs recommended. Other perks were the air conditioning and satellite T.V. The price was incredibly reasonable. I highly recommend this apartment to anyone who wants an authentic experience in a great historical neighbourhood. The location of this apartment is perfect for anyone visiting Buenos Aires who wants a front row seat to everything in San Telmo. We felt like we lived there. Lots of restaurants, mercados and shops nearby and the weekly street fair is right in front. Loved it! Rented apartment for 4 weeks and we enjoyed the apartment and surrounding area. You should be aware that the apartment Situated in the middle of a big city, and after a street market on Sundays. On weekdays, it was not much noise just around 6:00 but it did not disturb us, more noise it was on a Sunday, but we was vacant and in a big city, so what! Depositen refunded on departure day without problems. Some lament! Missing a small pot and some wine glasses. for appearance's sake in the apartment should curtains hang repaired (not much work), the bed should have been softer. We thrived. La bienvenida fue muy linda y cordial. El servicio de taxi es más que recomendable! El departamento nos gustó mucho, la ubicación no puede ser mejor, solo no tan recomendable para personas muy sensibles al ruido. El depa tiene todo lo que uno necesita y nos sentimos muy a gusto. La próxima vez, este depa será mi primera opción!!! También se organizó de manera perfecta el check out ya que para aquel día estuvo anunciado un paro nacional, MUCHAS GRACIAS!!! Charming apartment with lots of character. Location is great with many cafes and restaurants close by, as well as the many markets where you can buy anything from fresh produce to handmade jewelry. The only drawback is the street noise that goes all day and night into the wee hours of the morning, don't expect to get any sleep. Perfect place in a real cool and exciting neighborhood, fully equipped very stylish loft, that gives you a lower eastside experience. Enjoyed it a lot! The apartment was very nice and clean, cozy and accessible to downtown. Excellent stay for one or two people. I stayed here July 2010. Location fantastic, agent good, apartment beautiful but payment difficult.